Christine M. Schneider grew up in Colorado and graduated with a BFA in Illustration from the University of Kansas. Christy owns Yellow Pencil Studio, Inc., an illustration and design studio in Lawrence, Kansas. 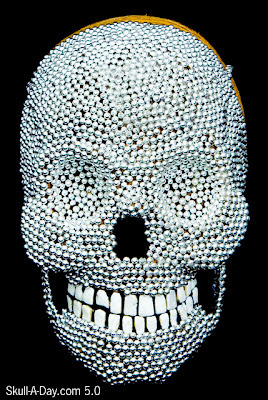 Ben Marcacci recently showed us his Iron Skulls from Afghanistan and now he's back with another terrific piece of heavy metal and this note, "I just finished up with this piece, Name after Wild Bill's infamous poker hand of Aces and eights (AKA Dead Man's Hand) when he was shot dead in 1876. This Piece, like my last is 100% scrap steel. 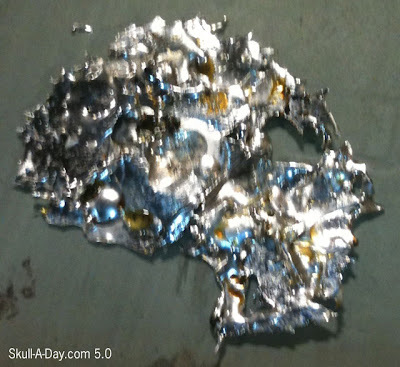 The skull and hat were cut from a truck tool box that had taken a hit, but there was still some straight steel left in it. Enjoy!" That's a nifty bit of welding ya done there, partner. Mighty fine work for a man with limited resources. Just like a true pioneer. 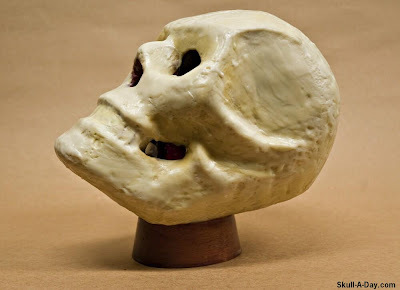 A pioneer of skull art. Many thanks again, Ben! 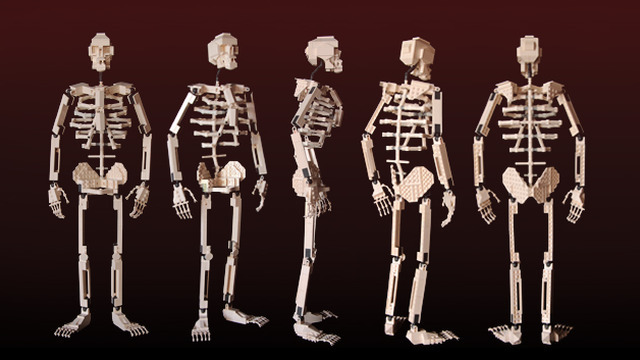 Help make the Lego Skeleton a reality. 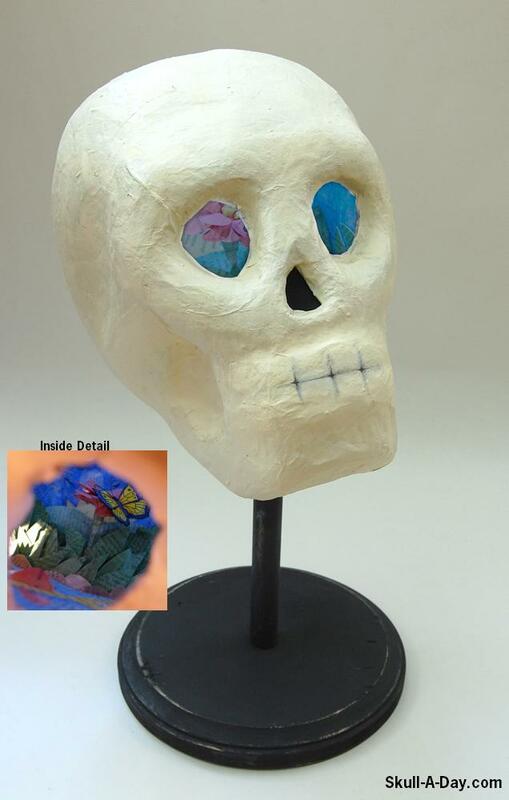 Skull-A-Day friend Clay Morrow AKA Choking Hazards (who kindly created the instructions for my Lego Skull), is trying to get his Lego skeleton design to be released as an official Lego product and he needs your help! Just give his project a vote HERE. And if he gets at least 10,000 votes it'll become a reality! 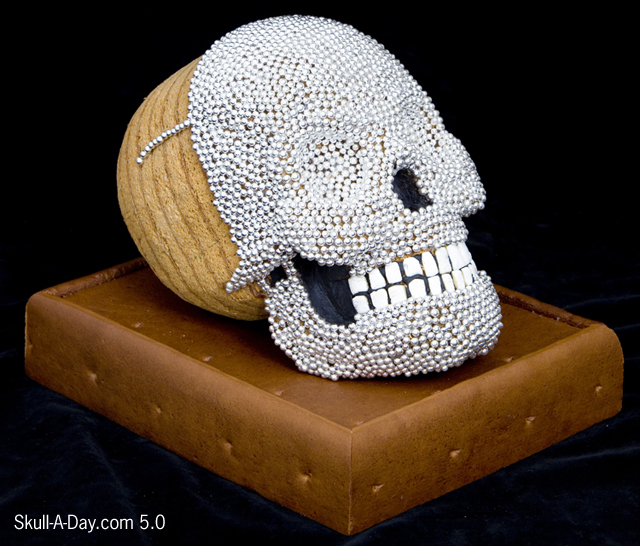 Danny Steadman and Scott McNeely from the UK, created this skull using ginger bread, edible silver balls, and chewing gum teeth. They are the winners of the Bene EAT ART competition. The designers with their creation. 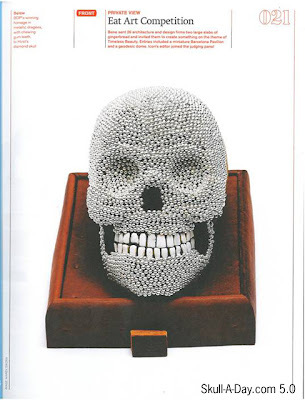 The skull was featured on the 8th page of January 2012's ICON magazine. Ever since I made my first (and only?) gingerbread house in elementary school, I've been fascinated with the gingerbread works of others. I've never seen something as sculptural, and tediously covered with edible silver balls, as this skull. The use of the chewing gum teeth remind me of using chiclet gum as teeth, as a child. The black, I have to assume is black icing. The use of icing in gingerbread works, is to adhere details to the dense gingerbread. 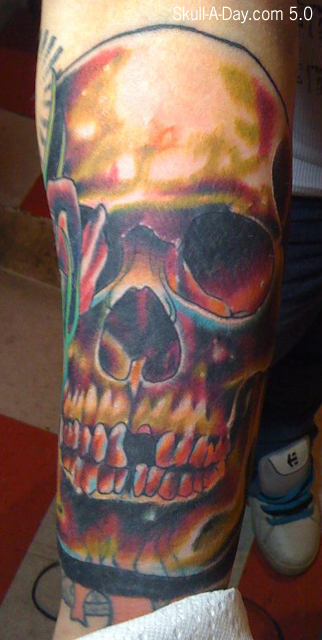 The choice of black works well a shading for the skull and add to the visual depth. This is definitely worthy of an award. Congrats guys! 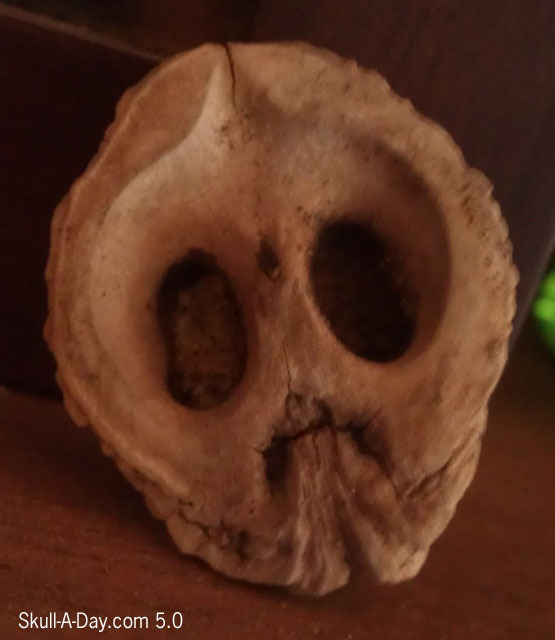 Marie Austin of Edmond Oklahoma found this "Nutty Skull" while chasing after her kitten Motorhead. 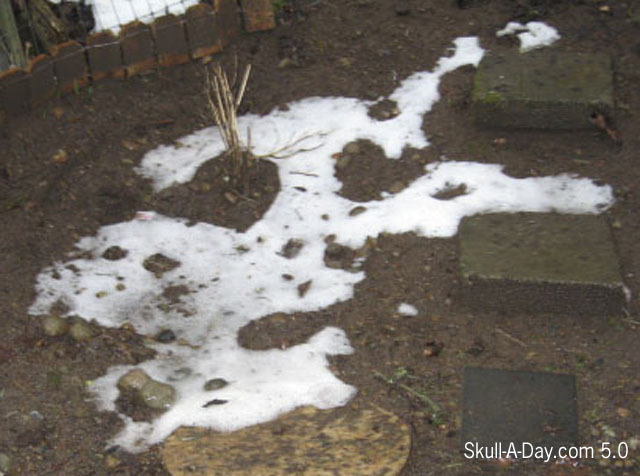 Briannaa Ariel found this skull in the melting snow outside of her door. Shaun Andruk "made this solder skull by accident while using a big 200watt soldering iron." That's right. You had to know that with all of the great submissions we get, some don't get posted quite around the time we receive them. 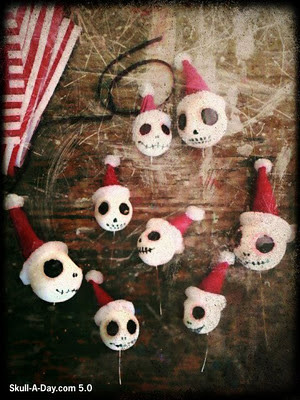 So knowing that I now have the pleasure of reminiscing with a couple of festive holiday skulls to share with you. These happy skulls were spreading holiday cheer in Croatia when Lindvall Mario made these decorations that were donations for an abandoned children benefit. And Emily Kalatzis agrees to the fullest when she asked us, "Merry...Halloween? 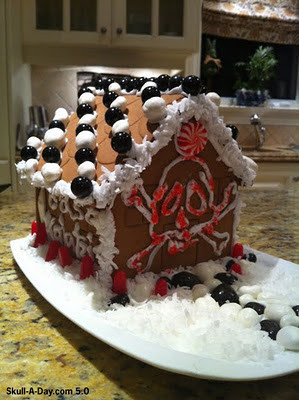 Who says we can't bring a few skulls into the holiday season?" True dat, Emily! Who says so? Nobody, that's who! 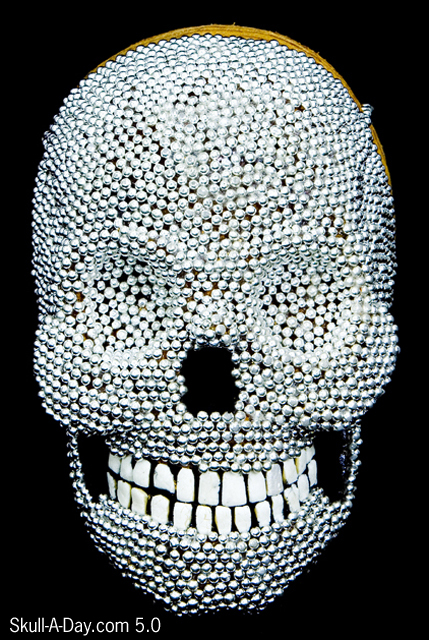 Thanks for helping us bring a jolly end to our weekend with your skulls. Remember everybody, there's only 331 days until next Christmas to make your friends and family hand made gifts from the heart. Make the most of them! Self described- Crazy artist, doll designer, accessories maker, and DIY addict- from Paris, France CocoFlower ** sent us this pair of crafty skull embroidery on little picture frame with lace. I have a certain affinity for the non-traditional fine arts, so it is always a please to see when some examples arrive in our in box. Thank you for sharing these wonderful pieces of your crafty work with us, as well as directing us to the prolific art that you feature on your blog. ** Non French speakers: see the Google translation of the blog HERE. Painting teeth is hard. But it's a fun challenge. 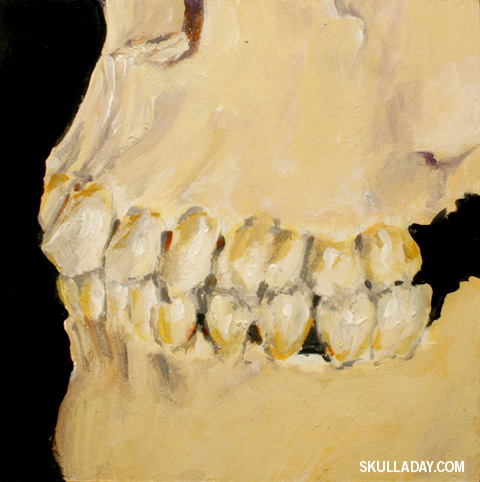 If you'd like to buy this painting you can find it in the Skull-A-Day store HERE. Recently, Wenchkin and I decided to trade mail art. She made me this piece, so this is my art for her. It will be mailed off today. I made this mixed media piece using water color paints, water color pencil, salt, ink, flower images from a gardening magazine, and thread, on water color paper. I wanted to do something reminiscent of the sugar skull and flower styles in past pieces, but with layers of patterns, mediums, and texture. To find out how I made this piece, read the tutorial. 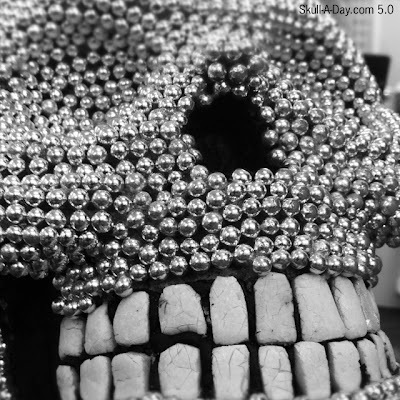 Denis Ricardo of Overexposure said "This is my second attempt at a 365, because of some unfortunate accidents happening last attempt, but i am back with a vengeance, and apparently, skulls! This year, it's more than photography and videography, or I at least plan on it being more than that. I want to draw, write, paint, but it will all be documented as a video or photo." In October 2011 Dav piece “Vanités” was featured in the “cabinet des curiosités” exhibition a group show with 21 artists from Toulouse, including many pieces featuring skulls! I am connecting with your “Vanités” piece. I enjoy seeing your collection of found objects that you shaped into skulls. Helping everyday objects find their inner skull are some of my favorite posts here. 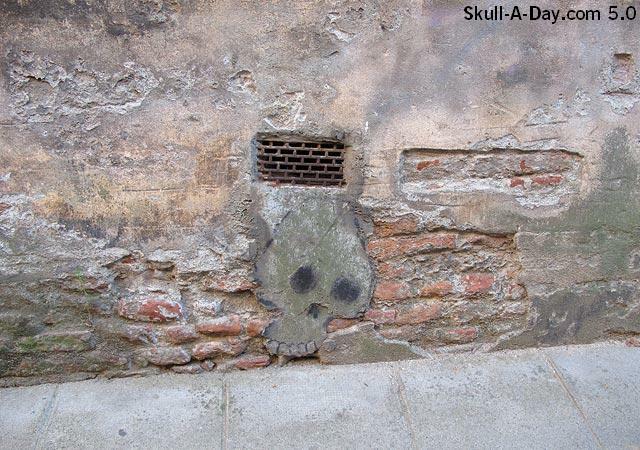 Since graffiti is illegal in most locations lets just say that wall piece was done with charcoal or some other non-permanent medium. *Kids if you reading this at home don't create art on other people's property without their permission. * Thank you Dav for sharing your pieces with us, and for sharing your blog about Toulouse's street art for us to check out. The skull created for the exhibit is to showcase Corn and how much it has infiltrated into our society. 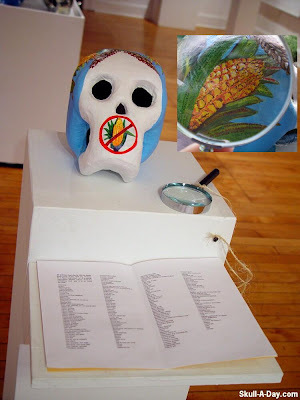 The skull showcases what corn derivatives are in the air (invisible), in our food (hidden, citric acid, ascorbic acid, polysorbate 60 and 80) and our hygiene products (vitamin E, Glycerine, Acetal Alcohol). Anything we may purchase will most likely contain corn or a corn derivative. CornFreedom.com was started to help gain understanding and awareness to a serious problem of corn intolerance which can cause many different reactions, from typical allergy responses to more serious Neurological shifts. These reactions can show up anywhere from 5 minutes after the exposure to a day after and discomfort can last up to 8 days. Due to Corn not being one of the top recognized allergens, the majority of medical professionals do not realize that the majority of emergency medications, operating room medicines, hospital stay medications, and prescribed medications as well as over the counter medications all contain forms of corn in them unless specifically removed. For example, corn starch is the top ingredient in almost all over the counter medications; look in your medicine cabinet read the inactive ingredients. Ms. Jurain asks you to show your support and like them on the Facebook Corn Freedom page. CONTEST REMINDER: Win a Wenchkin Calaca T-Shirt ENDS TODAY! THE CONTEST IS CLOSED! Thanks for participating! Don't forget to enter to win a Calaca T-Shirt made by Wenchkin. You have until Midnight EST TONIGHT to enter! Enter Here! Of course, you don't have to wait till the end of the contest to get your own Wenchkin creation, visit her shop to purchase one of her Wenchkin Calaca T-Shirts. Jud Turner received training in drawing and painting at the University of Oregon, under Professor Ron Graff and the late Professor Frank Okada, both renowned artists and educators. 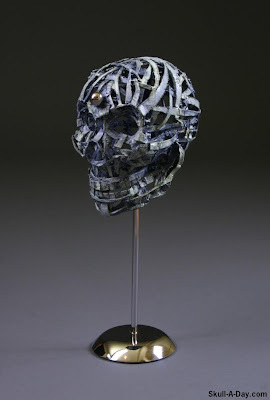 In the early 1990's, he transitioned to sculptural works as his main artistic output, focusing on direct welded steel work and found object assemblages. Currently, Jud lives and works in Eugene, OR with his beautiful wife, Melissa, and 3 cats. He spend as much time as possible welding, working, and laughing. To see more on the process of creating this piece for the exhibit please visit HERE. Ivailo Kostov makes our day a little more menacing with this devious looking "skullpture". I don't know what it's made of, but I do like the way it appears ancient and old, yet modern and mechanical. It's definitely something that belongs in a sci-fi movie. Thanks for sharing, Ivailo! 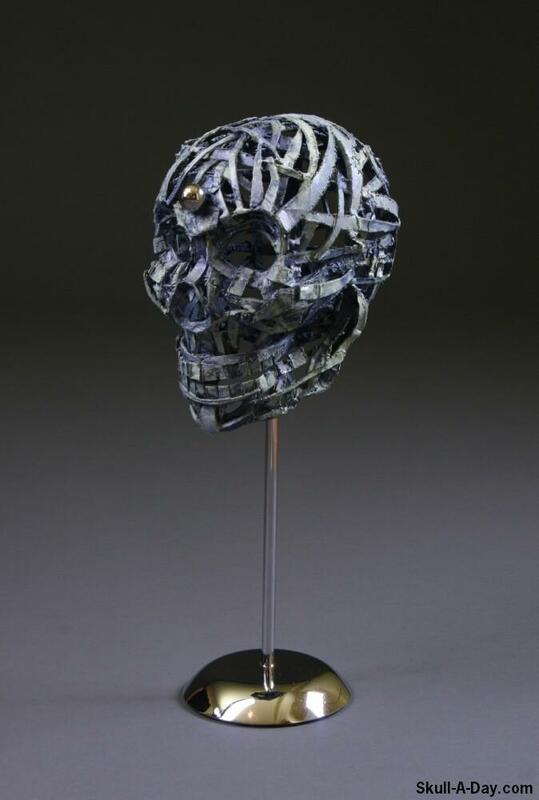 Ben Marcacci submitted this piece. He said "I'm a contractor in Afghanistan. 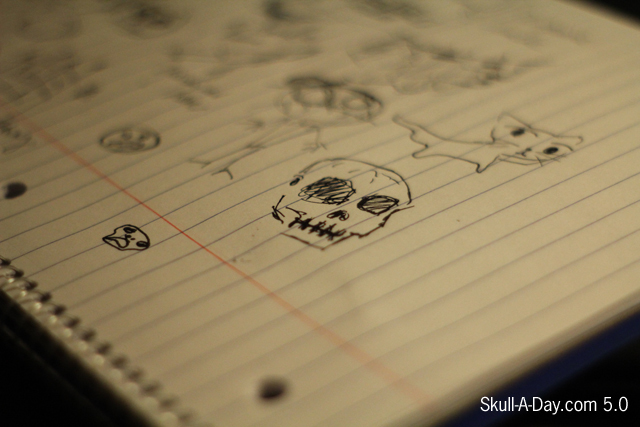 I work on my skulls on my lunch. Here's one. 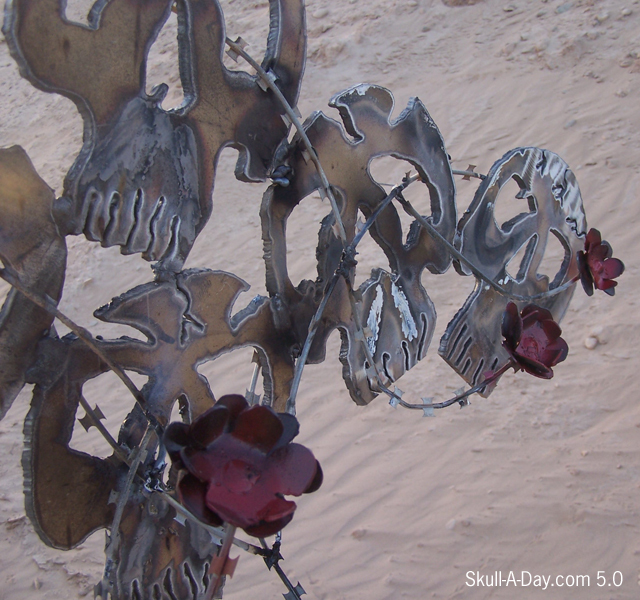 Its 100% scrap iron,with razor wire roses." This piece in it's setting speaks to how dangerous it is being in Afghanistan. 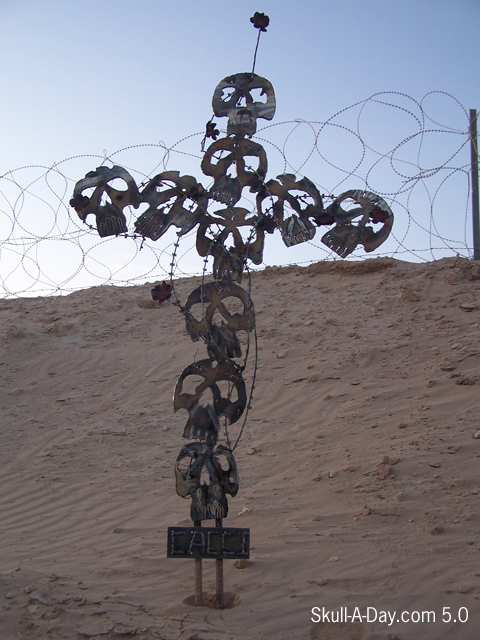 Against a background of barbed wire, military buildings, sand, and helicopters, it stands as a warning to new entries and memorial to those who have died in this dangerous pursuit. The cross in it's self is beautifully made. 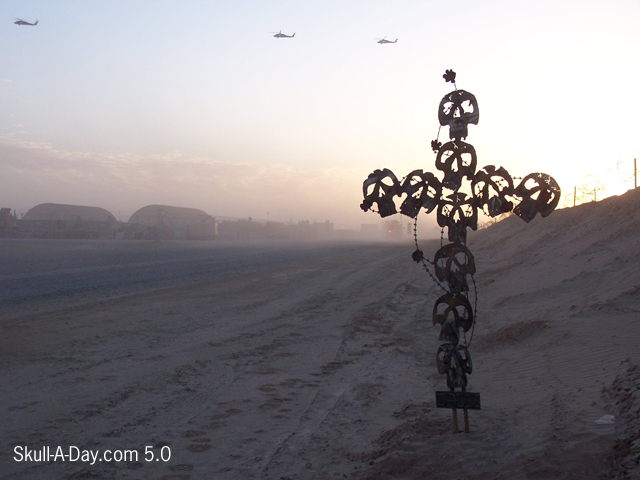 Here's hoping that one day, they will all get to come home. CONTEST REMINDER: Win a Wenchkin Calaca T-Shirt! 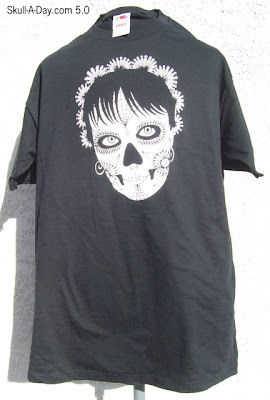 Don't forget to enter to win a Calaca T-Shirt made by Wenchkin. You have until Midnight EST on Wednesday to enter! Enter Here! 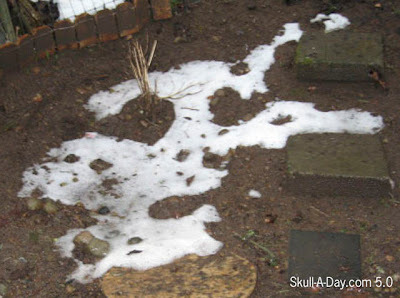 Today's skulls were found in various places. 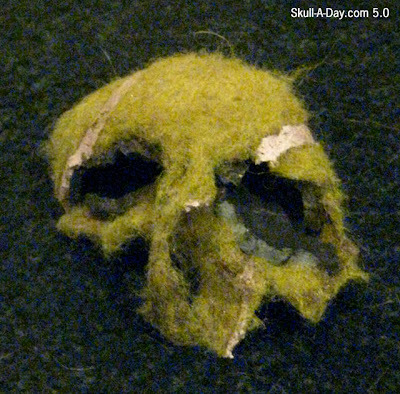 Thatcher Molotov said found this skull made from a tennis ball his dog chewed. 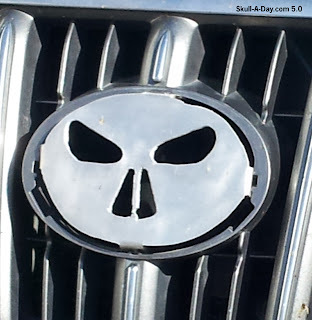 Jeff Osgood from Niwot, Colorado found this skull on a grocery bag. 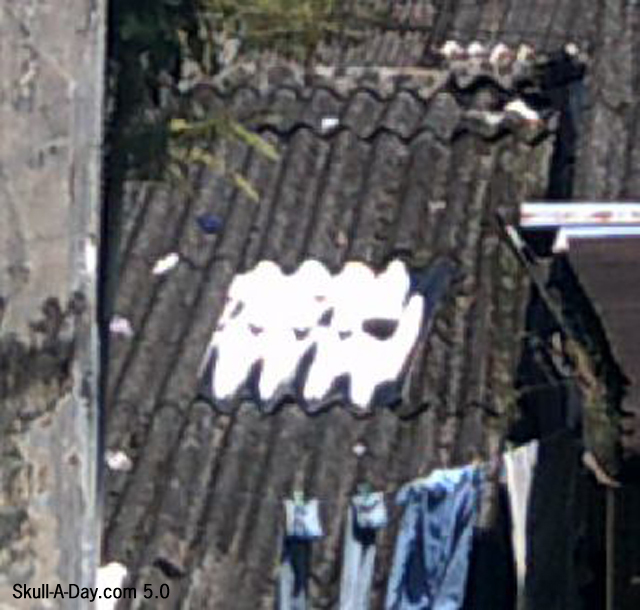 Daniel Muñoz from Buenaventura, Valle del Cauca, Colombia, said "One day, I saw this particular skull in a neighbour's roof." Norm Mulone of New Orleans, La shows us his "attempt to individualize my common ride". 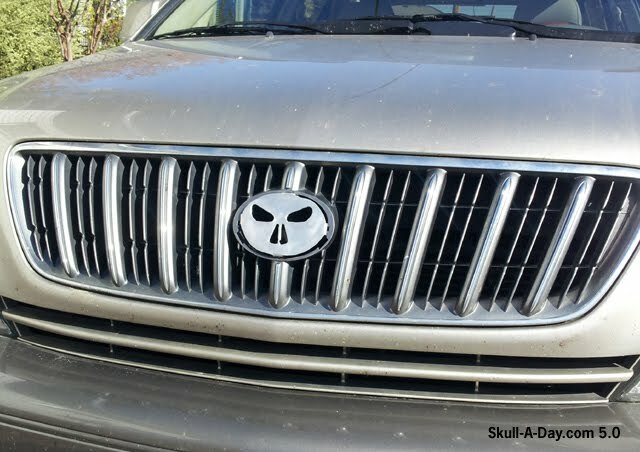 Perhaps this is the beginning of a new "Skull My Ride" trend. 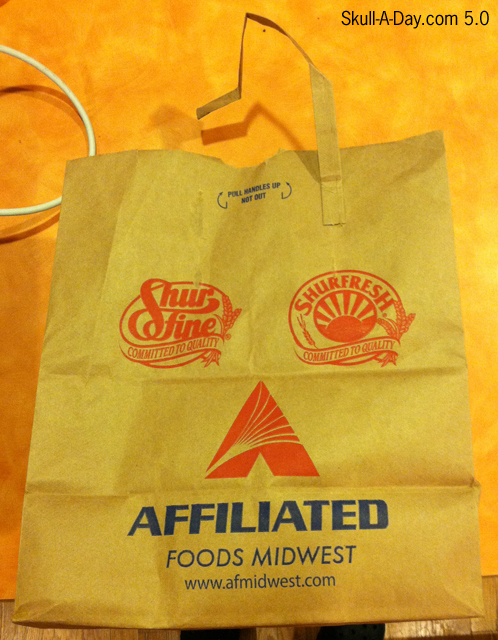 Like an good logo, it's simple yet stylish and totally recognizable. Hmmm, "Skull My Ride" sounds like it would be a HUGE hit if any networks wanted to produce it. You know where to reach me. 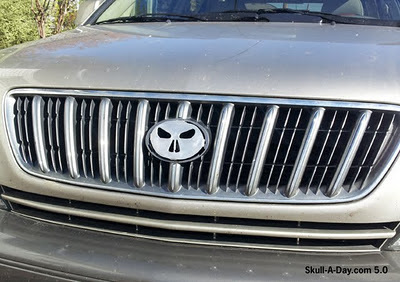 Thanks for showing us your grill, Norm! Skull-A-Day friend Jud Turner recently completed this “Mammoth” piece. It is always a pleasure to see the work that is created using recycled items. 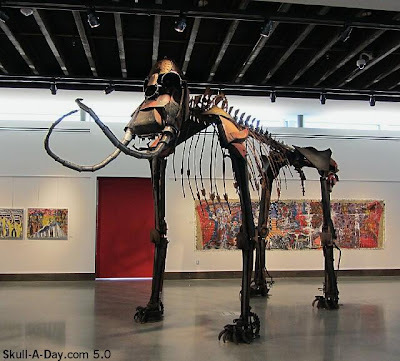 I find it fascinating to look at all the different components that make up this particular piece and try to imagine what their original purpose was for. Thank you for continuing to be a friend of the Skull-A-Day community and your past support of our work. Since it is Friday be sure to flashback to some of Jud’s other featured work HERE. CONTEST: Win a Wenchkin Calaca T-Shirt! 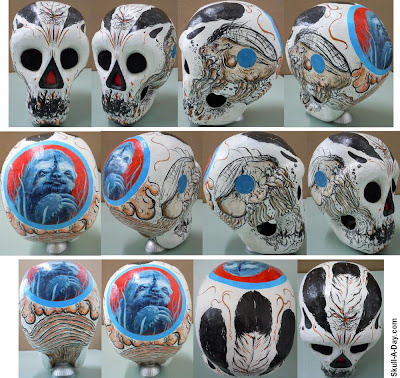 Wenchkin is a "self trained artist and New Mexico resident whose work has been heavily influenced by Dia de los Muertos, underground and pop art." 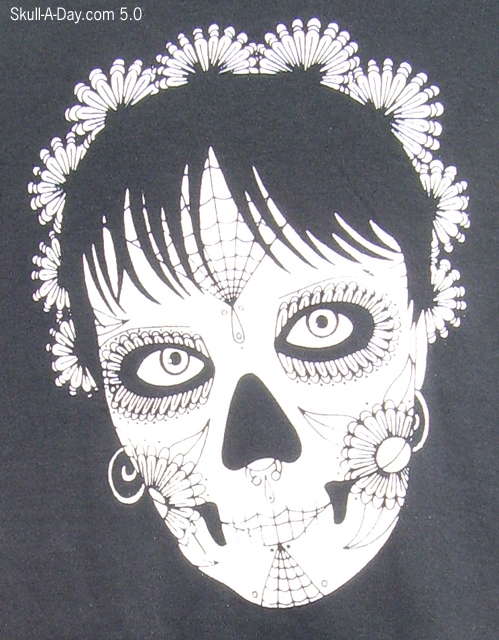 She would like to share her love of art by giving away a large Wenchkin Calaca T-Shirt to one lucky Skull-A-Day fan! Wenchkin explains how she came about her style of art. "In her 7th grade art class, she was told 'nothing came with a fat black outline around it, and now, 15 years later, it is a defining element of her style. 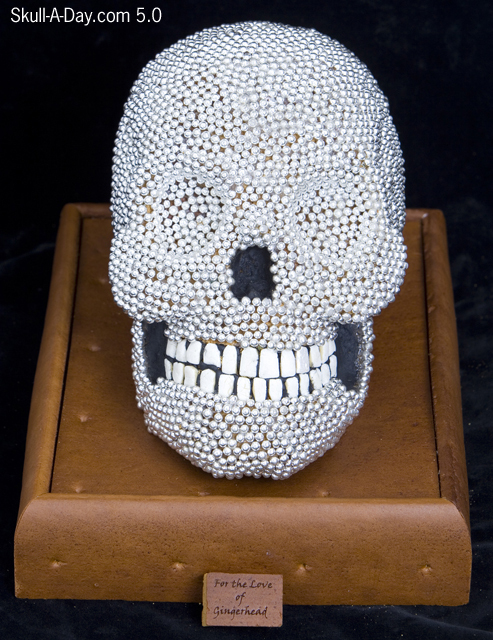 She clearly has a fixation on skulls, but her artwork is also known for bringing a bit of lightness, humor and color to darker subjects. Wenchkin creates original, one of a kind acrylic paintings, custom muerto illustration portraits and modifies various toys and objects." 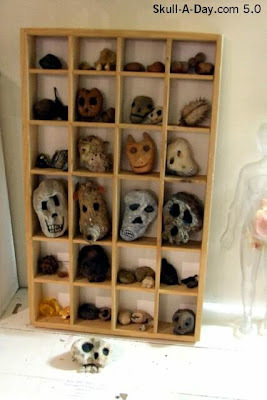 You can see more of her artwork on her Google + and Facebook pages. Since Wenchkin turns photos into skullified illustration portraits, to be entered into the contest just leave a comment saying how you would skullify yourself. IMPORTANT: Don't forget to include a way to contact you (either an e-mail in the post OR make sure your Blogger profile has a working e-mail link for you on it). Entries are only valid with this information. You have until just Midnight Eastern Time Wednesday, January 25th to enter so don't delay! NOTE: Wenchkin will pay for shipping to the winner. 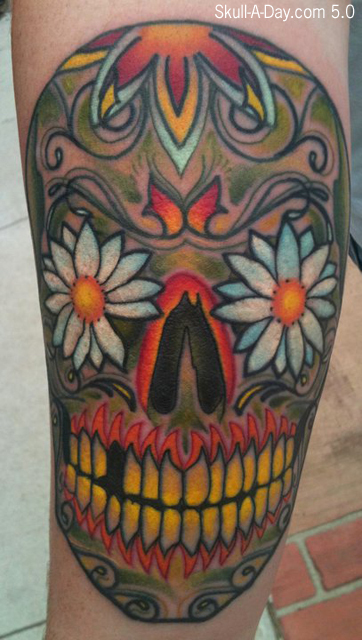 These colorful skull tattoos were done by "Timm McKenny, Jason Solomon, and Eric Solomon from Addictive tattoo in Sioux City, IA at Addictive Tattoo. 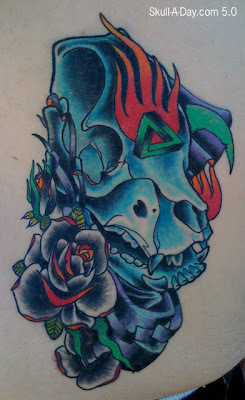 The Blue Pig skull reaper was done by Timm McKenny. The Multi colored human skull was also done by Timm McKenny. The color sugar skull was done by Jason Solomon. 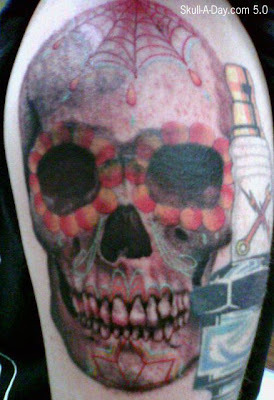 At least 3 of the 4 of us Skull-A-Day crew have one or more skull tattoos. When I see the artists send us photos of their tattoo work, it gets me thinking about new pieces. I like seeing the various styles of a fairly common tattoo motif. The style is what personalizes it for the wearer. Obviously getting tattooed is a big commitment, so finding a design that suits you is very important. For us, I think we all either had them (or in my case planned on getting one) before we ever met, and now it's one way we show our solidarity. 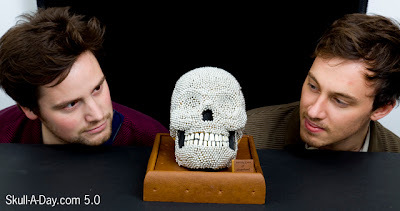 It's a long term way of showing our love of skulls.